I have worked as a customer service representative in the PCB assembly industry for 21 years and have seen a great deal of attention and change to improve overall customer service over that time. Key to providing great customer service, no matter what industry you’re in, is always focusing on the customers’ needs first and foremost. Customer Centric Teams – We’ve organized our teams around our customers (in our world, we refer to them as Customer Centric Teams). Each team has their own designated customers to make sure that all of our customers’ needs are met and nothing is overlooked. 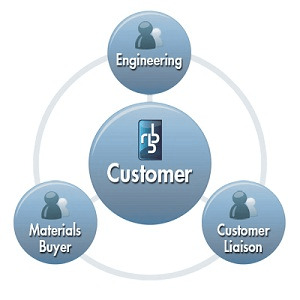 The teams are made up of a customer liaison, an engineer and a buyer. A Master Scheduler – By putting one person in charge of scheduling all jobs and managing that traffic, our delivery times and scheduling capabilities have vastly improved. A Shop Optimized for your Customers’ Needs - Being in-tune with our customers and listening to their needs, we recognized that we needed to add new equipment to service them appropriately. In our case, this included in house x-ray capabilities, an environmental chamber, selective solder and an AOI machine. Regardless of the equipment you need to bring in, the takeaway is the same. As a result of making these changes, the customer knows that we are paying attention to their ideas and have their needs in mind when making decisions at our company. Commitment to Customer Satisfaction – No matter the challenge, question, or problem, we’re committed to our customers’ satisfaction. We do what we say we’re going to do, and ensure the customer has a good end experience. Going the extra mile (in our case, moving heaven and earth) goes a long way to providing excellent customer service. Clear Communication – Most customer service challenges stem from poor communication. We’ve found that this is no different in the PCB assembly industry. No matter the industry you’re in, or the customers you serve, communicate clearly and professionally to your customers. Provide the appropriate level of detail they need to understand the situation, challenges, and proposed solution. Handle their complaints with a pleasant, patient and friendly attitude. And be honest with them about how you’re going to handle it. Flexibility – Being too hard-nosed about the rules, process, deadlines, etc., can send your customers running to the hills. We’ve learned that being flexible with our customers, scheduling the job when it works for them (as well as when it works for us) goes a long way in keeping a healthy relationship with our customers. Passion, Respect, and Care for our Customers – Perhaps the most important key to awesome customer service… demonstrating your passion, respect and care for your customers will go much farther toward building a strong relationship than any discount, special favor, or other tactic you might employ to getting them on your good side. Even though some of these practices are newer, all in all, the one thing that hasn’t changed over all of my years in customer service is giving each customer our whole-hearted attention. We’ll still continue to “move heaven and earth” on a daily, sometimes even hourly basis to make sure that happens. It’s a Win-Win for both our customers and our company. Are there other things you’re doing to ensure top notch customer service for your company? Patti has been a part of the RBB team for over 20 years. She is the chief liaison between customer purchasing departments and RBB Operations, entering orders, communicating order status information, and staying on top of parts issues that often make or break production schedules. Want to find out more about our Customer Centric Teams approach? Contact Us today to learn more!